The ones that we have selected based on our reviews below are definitely not cheap, but they will get your clubs to your destination in one piece. They will be able to withstand the beating from the airport baggage folks without causing any damage to your golf clubs. So, without wasting a lot of time – lets look at our recommendations of the best golf travel bags in the market. The ATA golf travel case from SKB is hard type case that is made from ultra-high molecular weight polyethylene. This material is so durable and strong that it helps keep your clubs safe and secure while literally being thrown around by the baggage handlers. SKB’s perfect match valance bending system provides a tight fit that prevents just about anything from getting into the case. The locking system is TSA accepted and recognized. The golf travel bag is huge to accommodate most of your equipment and even a lot of apparel that you may need during your game. For the price, its one of the best hard golf cases out there in the market. The hard sided travel cover case from Samsonite is made from solid ABS that ensures protection of your golf equipment during travel. The inner of the hard case features a padded quilted interior with extra foam cushioning on top to protect club heads. The 4 multi directional spinner wheels ensure that the entire unit can rotate 360 degrees, if required. In addition to the 4 wheels, comes with 2 in-line skate wheels which allows the case to be pushed or pulled very easily. 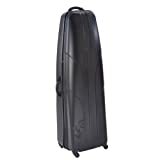 Priced at around $199, the hard case cover is well thought out and comes in a robust design thereby meeting its requirement of secure and efficient golf travel. CaddyDaddy has been a manufacturer of exceptional golf travel bags, golf bags and premium golf accessories for over 15 years. The Constrictor 2 Golf Bag Travel Cover from them can easily accommodate 10″ inch golf bags. The easy rolling easy in-line skate wheels make sure your experience of going through an airport a complete breeze. It is very well padded on top to provide superior protection to your golf heads. The 2 internal and external straps hold your belongings easily and are easy to lock. 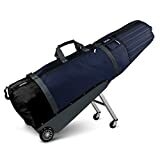 This golf travel bag from Amazon is made from waterproof durable nylon fabric. The smooth rolling wheels allow effortless movement of the bag through airports. The main compartment can accommodate a medium size golf bag with golf clubs up to 50 inches long. The full length zipper offers easy packing and unpacking. Being a soft golf travel cover, tis bag is very light and easily collapsible when not in use. The Intech Golf Travel bag comes with superior molded wheels which offers smooth rolling during travel. Padding throughout the bag is pretty minimal, but is adequate for protection. The zippers, handles are made of sturdy materials. There is a handy shoe pocket in the front of the bag that offers extra storage for your golf shoes. The full wrap around zipper makes packing and unpacking your golf clubs a breeze. The shoulder makes it easy to carry around. For the price point, it makes an excellent bag. 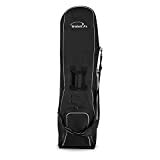 When deciding to buy the best golf travel bag, you need to consider a lot of external factors like where you play, how you play and what you need on the course. If golf trips is a one-off case, a soft cover may be just the thing you need. On the contrary, if you are traveling to a new course every weekend, you will likely want the extra protection a hard bag provides. But durability is not the only factor to consider when choosing a travel golf bag. A serious golfer knows that a round of golf requires more than clubs. Your golf bag travel case should be spacious and organized enough to hold other necessary gear and apparel that you may use on course.